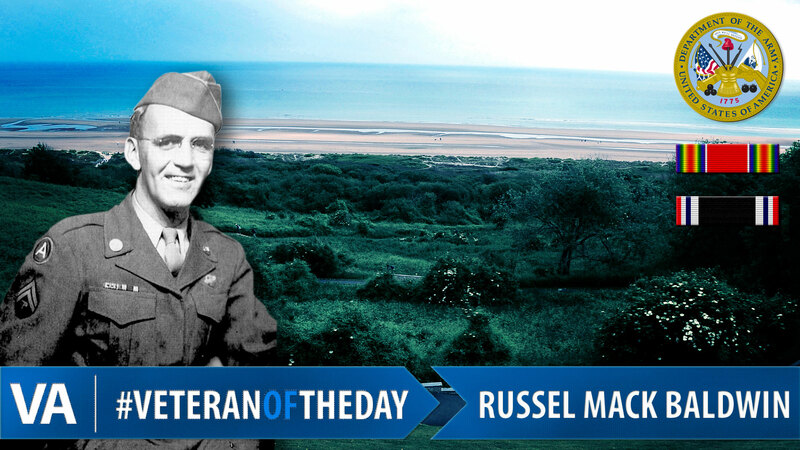 Today’s #VeteranOfTheDay is Army Veteran Russell Mack Baldwin. Russell served between 1941 and 1945 during World War II. In an interview with the Veterans History Project, Russell described how he was working as an optometrist when he was drafted in October 1941. In the Army, he served as a combat medic with the 551st Heavy Pontoon Bridge Battalion. Throughout the war, Russell was deployed to France, Belgium, Holland, Germany and Austria. Russell fought in the Battle of the Bulge and D-Day. He and his unit landed at Utah Beach in the second wave after D-Day. Russell was captured by German soldiers and was a prisoner of war for more than a month before the German soldiers were forced to retreat. After the war, Russell returned to his family’s home and learned that his family had rented his room out to a student, who Russell would later marry. Russell passed away on May 27, 2003. We honor your service, Russell. Graphic created by Carl J. Valentino: Carl J. Valentino is a student at the University of Delaware with a Major in International Business and a Minor in Graphic Design.